A week has passed since my last day at REEF and I am home reflecting on all the fins I got to see during my three months in The Keys. I was able to help trained NOAA volunteers by going out on turtle walks. During the months of June and July, Loggerhead sea turtles come ashore in Islamorada to nest. On our Sea Oats Beach, we had 21 nests and 15 false crawls this season. A false crawl is a marked incident where it looks like a turtle has come ashore to nest but there was no nest dug; this usually happens if the turtle gets spooked or the conditions are unfavourable. After 60 days since being marked, nests are checked regularly for signs of hatching. I was able to help excavate 3 nests this summer and released 3 baby turtles that were trapped in a nest. We collected data on the number of eggs and which of those were hatched/unhatched. Then we open the unhatched eggs to record if they are fertilized or not. All this information is important to monitor the turtle population in the area. Since getting to know more fish species, I have started to appreciate seeing rare fish. For example, finding these Papillose blennies was a real thrill. I spotted them during a dive with Allison and Carlos Estape who are established REEF members and fish ID experts. Carlos was very excited by my find as this was the first time they have seen this species in the keys or otherwise. 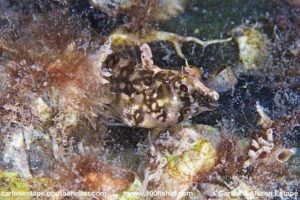 It is an especially rare find because it is not listed in the Alligator Reef and Evirons paper which is the most comprehensive list of species of the area to date; it contains 618 different blenny species! Another set of small fins belongs to the Mangrove blenny. 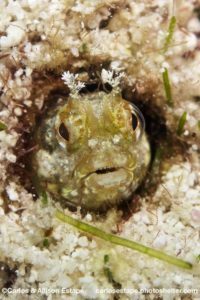 Amy Lee, REEF Trip Program and Communications Manager, informed us that she had seen a Mangrove blenny while snorkelling through some dock pilings. 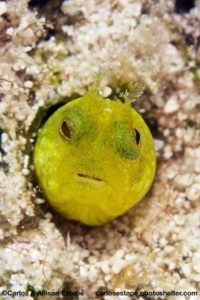 This was surprising news because Mangrove blennies have only been described to be in Cuba. So, we organized “The Great Bayside Blenny Hunt”. The group of us pictured below went out to find this far from home fish. After a couple of hours snorkelling, we were able to capture two live specimen and obtain in situ pictures. The specimens were sent out to a lab for DNA sequencing and we received word that our predictions were correct: this was in fact a Mangrove blenny. Thanks to our efforts, it was the first time its DNA had been sequenced and the first specimen captured in Florida since the 1960s. A high percentage of my summer consisted of helping with educational programs. A specific one that I will always remember is Force Blue. 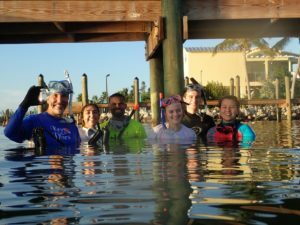 Force Blue is a program that unites Special Operations veterans and marine conservation professionals to create a team of conservation warriors. 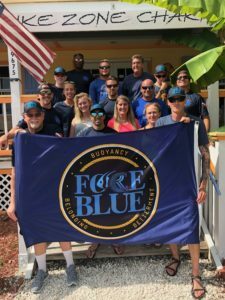 Force Blue employs these veterans’ highly trained diving skills to assist in conservation efforts which accomplishes two missions: helping to assimilate combat veterans to civilian life and supply aid and bodies to citizen science initiatives. 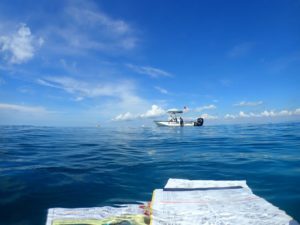 REEF participated in this program by training The Blue Force team to contribute to our database by surveying fish. We also educated them about the lionfish invasion and trained them to properly remove lionfish. It was an amazing opportunity to dive with these men and to learn a little bit about their world. For some of them, this was the first time they had seen a coral reef despite being trained divers for many years. 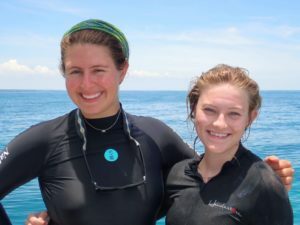 As far as the question I asked in my first blog, how REEF’s extensive database can be used to engage a wide audience on ocean conservation, I have decided to answer that by staying on past my internship to help with the Fishinar program. Fishinars are REEF’s brand of interactive webinars designed to teach the finer points of identifying fish. They are meant to be an aid for those already involved in our Volunteer Fish Survey Project and an introduction to fish surveying for those who are not. Fishinars can also be on relevant topics of ocean conservation. I will be helping to grow this program by sourcing different advertisement opportunities and creating topics to deliver a Fishinar myself. Speaking, as a form of science communication, is a passion of mine and I am excited for the opportunity to grow that skill. My time here at REEF gave me first hand experience in the world of marine conservation. Because of this experience, I now have a better understanding of where I want to contribute in the future. The connections I made and the chances I had to grow my skill set were invaluable. I have many people to thank but especially my supervisor, Ellie Splain for giving me the trust and encouragement to accomplish my goals this summer. As well, thank you to the Our World Underwater Scholarship Society who without, this experience would not have been the same. 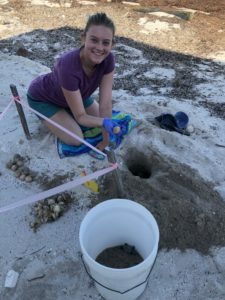 This entry was posted in 2018 REEF, Current Internships, Internship Journeys on September 16, 2018 by Ronnie Noonan. Now that we are through with camps for the summer, my remaining weeks will be spent either at the office or at a lionfish derby. The lionfish derbies are part of REEF’s Invasive Lionfish Program. They consist of dive teams, freediving or scuba diving, which collect lionfish by spearfishing or netting. There are prizes for the most, the biggest, and the smallest lionfish. Our remaining derbies for the summer are in Palm Beach and Jacksonville. Aside from taking lionfish out of the water, the other objective of these derbies is to demonstrate how tasty lionfish are. We serve free lionfish ceviche at the derbies and have a culinary competition by participating chefs. 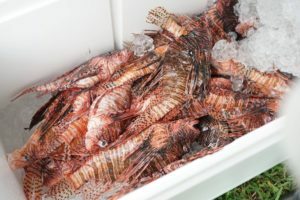 If we can increase the demand for lionfish by patrons at restaurants and grocery stores, then removal efforts by divers will become more cost effective. Two weekends ago my regular days were interrupted by a welcomed guest, Shannon Brown the OWUSS NPS intern! We managed to connect while she was here in South Florida at Biscayne National Park. She and other members of the NPS team took me out to the Maritime Heritage Trail to significant and very old ship wrecks. 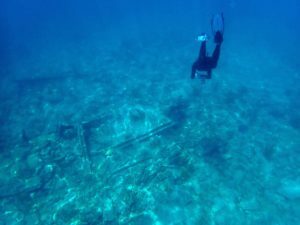 I did what I do best and conducted a fish survey on these wrecks. Because I am not AAUS certified, I could only snorkel these areas, but I was able to see plenty! Shannon and her co-worker, Joel, changed my perspective on Marine Archeology. While I was busy being distracted by the biology of the area, they were marvelling at the stories the structure of the ship could tell. With their help, I was able to appreciate what I was seeing a little bit more and understand their excitement for maritime history. Shannon tried on my hat and conducted a fish survey herself which she was very proficient at! The entire NPS team was extremely welcoming to me and it was a great reminder of what a privilege it is to be apart of the Our World Underwater network. Thanks again to Shannon for the pictures and to Dave Conlin for the warm welcome! 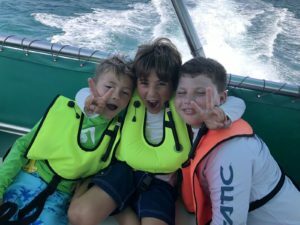 This entry was posted in 2018 REEF, Current Internships, Internship Journeys on July 27, 2018 by Ronnie Noonan. One of the programs here at REEF that I mentioned in my last post is the Explores Education Program. I am working specifically on the Ocean Explorers Camp. This is an environmental camp with an ocean focus for kids ages 7-12. Each day we are in or on the ocean in some capacity doing activities like snorkeling and kayaking. We host the camp at John Pennekamp Coral Reef State Park. The responsibility to physically be at camp as a counsellor switches between interns. When I am not actually there, I am working on camp curriculum design. This is one of my independent projects I have undertaken. Thanks to my last position, I have experience in environmental education camp program design. I am thrilled to be given the trust and support to exercise this skill set. In my previous position, I learned and implemented Earth Education Guidelines into my designs. Explained to me by my supervisor but synthesized by Steve Van Matre in his book, Earth Education, “Earth Education is the process of helping people live more harmoniously and joyously with the natural world.” By following the guidelines, you can hope to achieve three outcomes: feeling, understanding and processing. Essentially you aim to create programs that emotionally connect participants to the environment while also having them achieve an understanding on a subject of importance. The last outcome focuses on the participant’s own impact on the environment and how they can take action towards positive change. I am hoping to take my knowledge and experience using these guidelines to create a comprehensive program design that can be used by REEF in years to come. One of the program components I am creating is a “New World Scavenger Hunt”. Working with a local museum, The Florida Keys History & Discovery Centre, I have gathered information and resources on what life would have been like for the early European explorers and the Native American population of the area. The goal is to have the kids experience how these people interacted with the environment around them. My desired outcome on this particular component is to teach the kids that it is important to look at our past and the perspectives of others to make smart decisions about our environment. Education is in REEF’s name and I am excited to contribute. 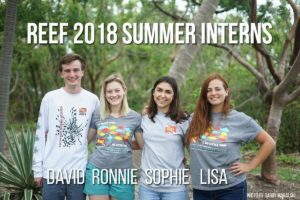 This entry was posted in 2018 REEF, Current Internships, Internship Journeys on July 18, 2018 by Ronnie Noonan.